Henry Steel was born in 1854 in Keymer, a village in Mid-Sussex about 2.4 miles south of Burgess Hill. [The birth of Henry Steel was registered in the district of Cuckfield during the 2nd Quarter of 1854]. Henry Steel was the eldest son of Maria Chatfield and James Steel, an agricultural labourer. Henry's father, James Steel, was born on the Greek island of Corfu around 1826, probably when his father (Henry Steel senior) was serving in the British Army. By the early 1840s, James Steel was living in Mid-Sussex. In 1844, James Steel (born c1826, Corfu) married his first wife Elizabeth Lindfield (born c1826, Keymer, Sussex) at Hurstpierpoint, a market town 8 miles north of Brighton. Seven years later, in 1851, James Steel's wife Elizabeth died of typhus fever. The following year, in the Spring of 1852, James Steel, a widower in his mid-twenties, married Maria Chatfield (born c1821, Hurstpierpoint, Sussex), the daughter of Martha and William Chatfield. After their marriage, Maria and James Steel settled in the village of Keymer. During their marriage Maria Chatfield and James Steel produced at least 5 children - Henry Steel (baptised in the Sussex village of Keymer on 4th June, 1854), Ann Steel (born 1856, Keymer), Mary Steel (born 1857, Hurstpierpoint, Sussex), George Steel (born 1861, Hurstpierpoint) and James Steel (born 1866, Burgess Hill). When the 1861 census was taken, James Steel, described on the census return as a 35 year old "Labourer", was living in Hurstpierpoint with his wife Maria and three of their children - Henry (7), Ann (5) and Mary (3) - plus fifteen year old William Chatfield (born c1845, Cuckfield), described on the census return as James Steel's stepson. Presumably, William Chatfield was the illegitimate son of Maria Chatfield. [At the time of the 1851 census, five year old William Chatfield was living in Cuckfield with his grandparents, William and Martha Chatfield]. When the 1871 census was taken, James Steel and his family were living at St John's Common, Keymer, but his eldest son, Henry Steel (born 1854, Keymer) was residing in Hove, Sussex. The 1871 census records seventeen year old Henry Steel as a "Baker" employed by John W. Wells, a confectioner of 40 Western Road, Hove. Around 1873, Henry Steel married a Scottish-born woman named Mary Carlyle (born c1850, Cummertrees, Dumfries, Scotland). This union produced a number of children - Jennet Elizabeth Steel (born 1874, Hove - died 1875), Henry Steel junior (born 1876, Hove, Sussex), John Steel (born 1878, Hove, Sussex - died 1884 ), Janet Elizabeth Steel (born 1880, Hove, Sussex - died 1884) and Janet Steel (born 1887, Hove, Sussex), but only Henry Steel junior and the younger Janet Steel lived beyond the age of 7. When the census was taken on 3rd April 1881, Henry Steel and his family were recorded at 102 Goldstone Road, Hove. On the census return, Henry Steel, who gives his place of birth as Clayton, Sussex, is described as a twenty-seven year old "Watchman". At this time, Henry and Mary Steel had three young children - Henry, aged 5, John, aged 2, and a baby daughter named Janet Elizabeth Steel. In the early months of 1884, Henry Steel's youngest son, John, and his youngest daughter, Janet Elizabeth, both died. Now with only one surviving child (Henry junior), Mrs Mary Steel gave birth to another daughter during the 1st Quarter of 1887. Henry and Mary Steel christened their new daughter, Janet, the same name that was given to their two previous daughters who had died young. In the 1880s, Henry Steel supplemented his income as a "Watchman" by taking in lodgers. [When the 1881 census was taken, the Steel household in Goldstone Road contained 4 paying boarders]. By 1890, Henry Steel and his family were living at No. 74 Goldstone Road, Hove. The census taken on 5th April 1891, records Henry Steel, his wife Mary, their teenage son, Henry Steel junior, and four year old daughter Janet Steel at 74 Goldstone Road, Hove. On the census return, Henry Steel is described as a "General Labourer", aged 37. Sometime in the early 1890s, Henry Steel set himself up as a photographer in Hove. Local trade directories indicate that Henry Steel established a photographic portrait studio at 74 Goldstone Road, Hove around 1894. The Trades Section of Page's Directory of Brighton & Hove, published in 1895, lists Henry Steel as a photographic artist at 74 Goldstone Road, Hove. The 1895 edition of H. & J. Barnes' Popular Directory of Brighton & Hove also lists Henry Steel as a professional photographer at 74 Goldstone Road, Hove. From the mid 1890s, Henry Steel produced both carte-de-visite and cabinet portraits at his studio at 74 Goldstone Road, Hove. The 1901 census records Henry Steel, his wife Mary and 14 year old daughter, Janet, living at 74 Goldstone Road, Hove. On the census return, 46 year old Henry Steel is described as a "Photographer" working on his "own account, at home". Around 1905, Henry Steel opened a second studio at 11 Hove Street, Hove (later re-numbered No. 9a). Henry Steel managed his studios in Goldstone Road and Hove Street in parallel until about 1913. After he closed his Hove Street studio, Henry Steel continued to take photographic portraits in the studio attached to his home at 74 Goldstone Road, Hove. Local trade directories recorded Henry Steel as a photographer in Goldstone Road until the mid 1920s. It appears that Henry Steel retired from photography around 1925 when he was in his early seventies. Only two of Henry and Mary Steel's children survived into adulthood - Henry Steel junior (born 1876, Hove, Sussex) and Janet Steel (born 1887, Hove, Sussex). Henry Steel's son Henry Steel junior, a bricklayer by trade, married Ella Annie Kean (born 1877, Cannington, Somerset) in 1904. Henry and Ella's first child, a baby boy named James Steel, was born in 1906. Two more sons were born during the next 4 years - William Frank Steel in 1908 and Arthur Steel in 1910. A daughter, Ella Steel, arrived in 1914. The following year Mrs Ella Steel gave birth to her fourth son, Henry Steel. [The birth of Henry Steel was registered in the district of Steyning during the 4th Quarter of 1915]. The couple's final child, a daughter named Phyllis Steel, was born in Hove in 1919. Early in 1911, Janet Steel, Henry Steel's daughter, married William Alfred Field Buss (born c1889, Jarvis Brook, Sussex), a twenty-two year old "Domestic Gardener". When the census was taken on 2nd April 1911, Janet and her new husband were residing with Henry and Mary Steel at 74 Goldstone Road, Hove, the location of Henry Steel's photographic studio. 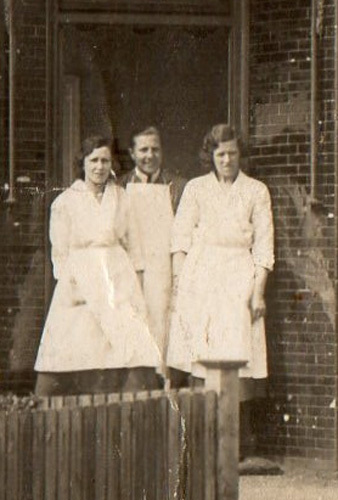 Two daughters were born from this union - Janet Buss (born 1914) and Ada Buss (born 1920). Henry Steel died in Brighton in 1952 at the great age of 97. 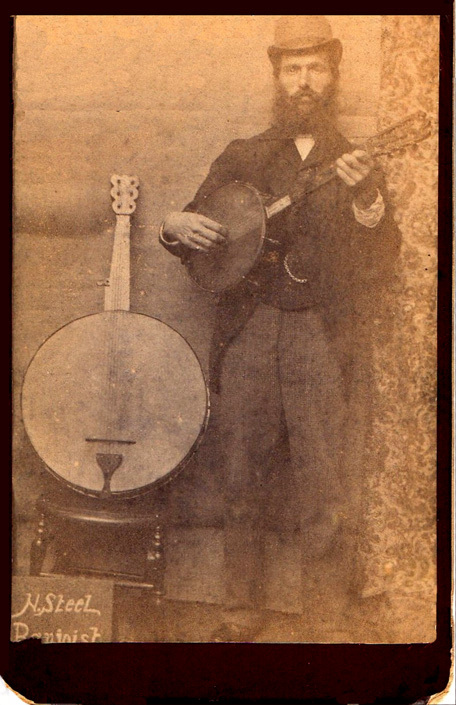 [ABOVE] A portrait of the Hove photographer Henry Steel playing the banjo (c1892). At the foot of the photograph is a sign which reads "H. Steel, Banjoist". [ABOVE] A cabinet portrait of the Hove photographer, Henry Steel (1854-1952). 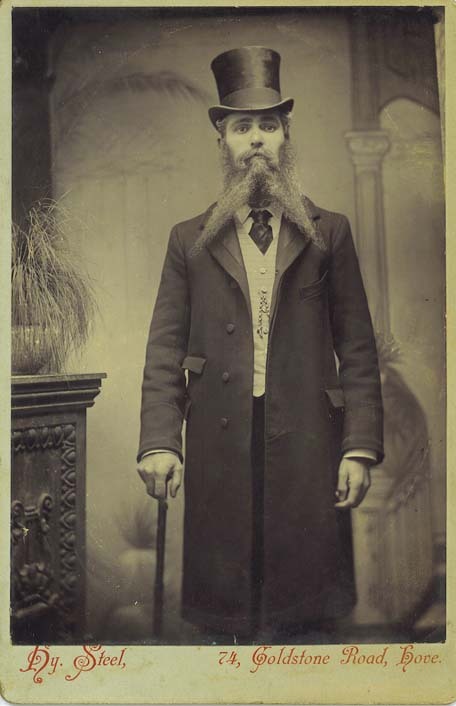 This unusual portrait of Henry Steel wearing a top hat and sporting a magnificent forked-beard, was taken at Steel's studio, which was attached to his family home at 74 Goldstone Road, Hove. When this portrait was taken in the late 1890s, Henry Steel would have been in his mid-fifties. [ABOVE] Henry Steel junior and his Family, a group photograph taken around 1910 by Henry's father, Henry Steel senior (1854-1952). 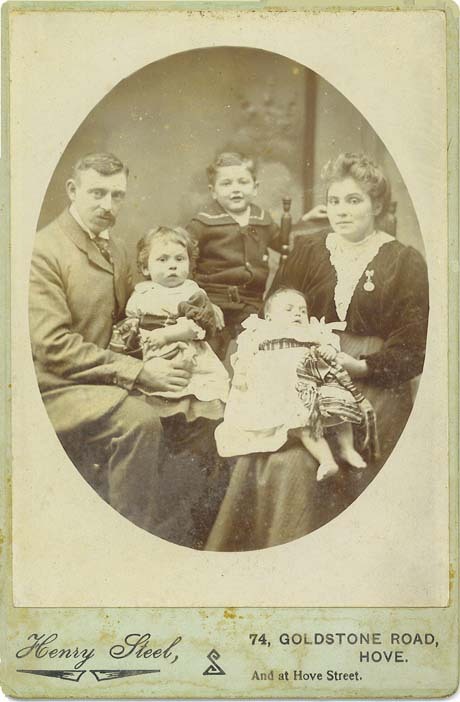 When this family portrait was produced, Henry Steel senior was operating two photographic studios in Hove at 74 Goldstone Road and Hove Street. Henry Steel junior (born 1876, Hove, Sussex), a bricklayer by trade, had married Ella Annie Kean (born 1877, Cannington, Somerset) in Hove in 1904. The couple's first child, James Steel, was born in 1906. Two more sons were born during the next 4 years - William Frank Steel in 1908 and Arthur Steel in 1910. 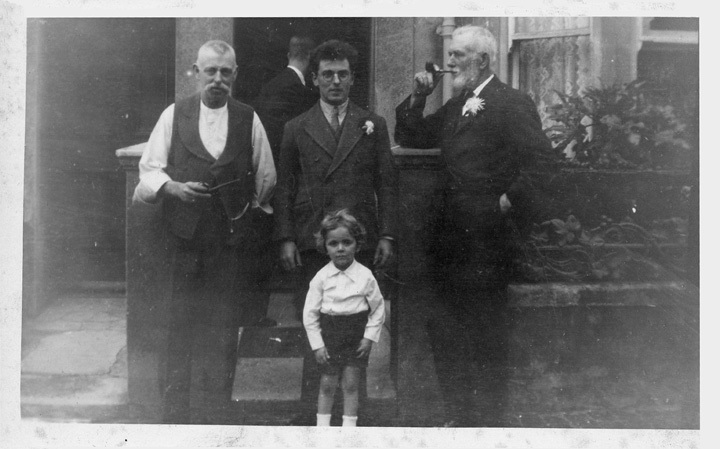 As this cabinet portrait was produced around 1910, it is likely that it shows, from left to right: Henry Steel junior (1876-1959), William Frank Steel (born 1908, Hove), James Steel (born 1905, Hove), Arthur Steel (born 1910, Hove) and Mrs Ella Steel (1877-1946). In 1911, Henry Steel junior, his wife Ella and their three sons, James, William and Arthur, were living at 51 Shakespeare Street, Hove. 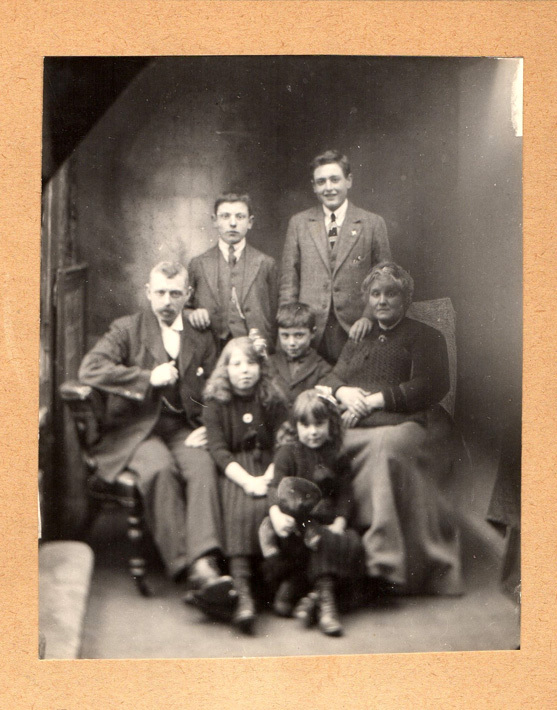 [ABOVE] This family group photograph shows Henry Steel junior and his Family as they appeared around 1920. Standing in the back row are Henry and Ella's sons William Frank Steel (born 1908) and James Steel (born 1905). Henry Steel junior (born 1876) is seated on the left and Mrs Ella Steel (born 1877), Henry's wife, is seated on the right. Positioned between his two parents is Henry Steel (born 1915). The two girls at the front are Ella Steel (born 1914) and her younger sister Phyllis Steel (born 1919). James Steel, the eldest son of Henry Steel junior, was born in Hove on 17th December 1905. 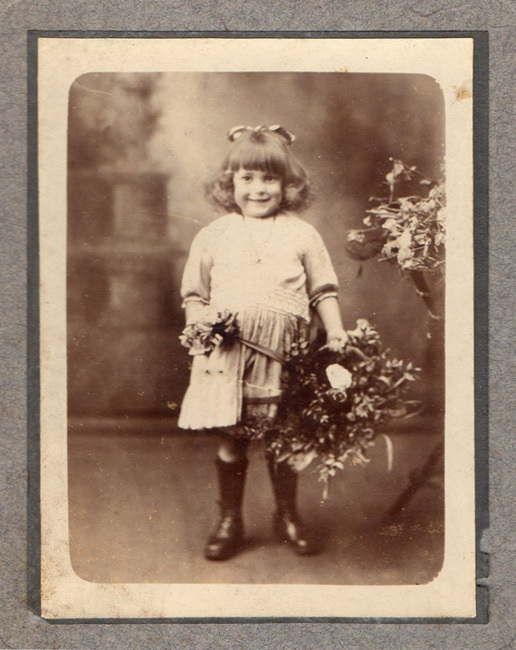 [Birth registered in the Steyning District of Sussex during the First Quarter of 1906]. In 1928, James Steel married Gladys Thirza Reeve (born 1900, Camberwell), the daughter of Sarah Whittington and Burwood Orlando Reeve, a coffee house keeper of 34 North Road, Brighton. James Steel died in Hove in 1974, aged 69. Ella Steel, the eldest daughter of Henry Steel junior, was born in Hove on 20th May 1914. In 1938, at St Barnabas Church, Hove, Ella Steel married Archibald Philip Newnham (born 1917, Lewisham). Mrs Ella Newnham (formerly Steel) died in Hove in 1993, aged 78. 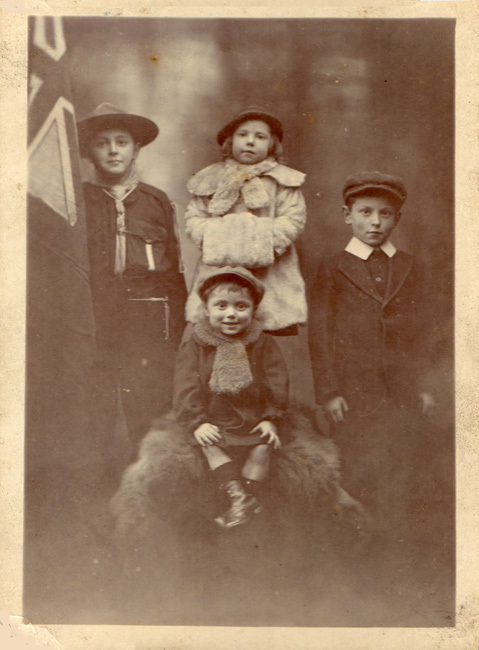 [ABOVE] Ella Steel (born 1914, Hove) dressed up for winter, standing in the midst of her three brothers, James Steel (born 1906), Henry (born 1915) and William (born 1908). [ABOVE] Ella Steel (born 1914, Hove), the eldest daughter of Henry Steel junior (1876-1959) and the grand-daughter of the Hove photographer Henry Steel senior (1854-1952). 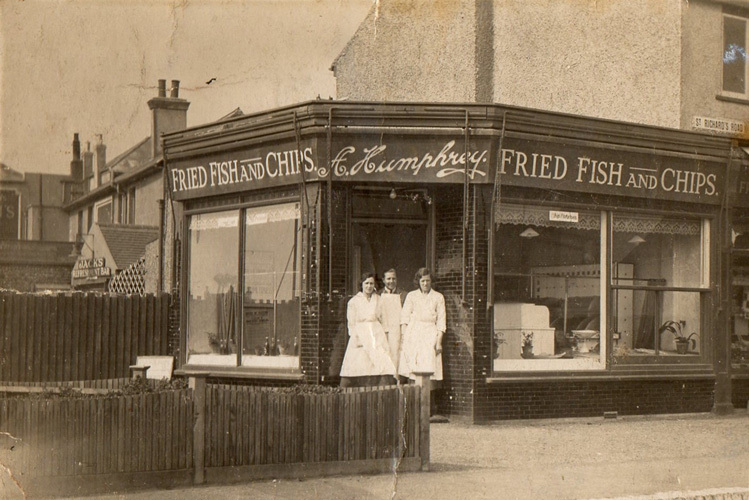 [ABOVE] Archibald Newnham (born 1917, Lewisham) pictured in the doorway of Humphrey's Fried Fish & Chips Shop. Thanks to Richard Newnham, a great grandson of the photographer Henry Steel for providing family photographs and information relating to the Steel Family of Hove. Richard's father, Archibald Newnham, married Ella Steel, the grand-daughter of the Hove photographer Henry Steel (1854-1952). I am also grateful to Colin Goldsmith, the great grandson of James Steel (1866-1919), the younger brother of Henry Steel, the Hove photographer, who has also provided family photographs of Steel Family of Hove.